In late March, the Kommersant newspaper in Russia revealed government plans to make the Arctic region the country’s main strategic base by 2016. Documents from the Russian Security Council indicate that highly trained military units will be deployed in the area to protect the country’s interests in the oil and gas reserves found under the ice. Russia’s Arctic envoy, the aptly named Artur Chilingarov, said the specialist forces would be “capable of guaranteeing security under various military and political situations”. The Arctic Ocean is home to one-quarter of the world’s untapped energy resources, and given the UK’s role in European and world affairs in recent centuries, it is not surprising that the UK’s Armed Forces still train for possible confrontations in sub-zero temperatures. But if you knew that a significant number of servicemen undertaking Arctic warfare training each year are plumbers, HR payroll managers and insurance brokers, you might imagine a scene from Dad’s Army. You would be wrong. “The 21st-century reservist does everything a full-time soldier does. The only difference is that he has another job to do,” said Captain Tim Hebberd, visits officer for SaBRE (Supporting Britain’s Reservists & Employers), a Ministry of Defence initiative. In March, I joined 77 reservists from the Territorial Army and the Royal Marines Reserves on Exercise Hairspring in Norway, where they were spending two weeks in exceedingly bitter winter conditions. The reservists’ annual training varies hugely, ranging from jungle to desert locations and everything in between, and the 14-day stint comes on top of weekly training at their local reservist headquarters, and frequent weekends away in the UK for intensive training with their unit. Also along for the ride were 10 people from various UK employers, ranging from Northumberland prison HMP Castington to Lloyd’s of London, many of whom had reservist employees on the exercise. The party of employers and journalists were kitted out in several layers of fatigues and bulky combat-ready backpacks. Flying to the Arctic Circle via Oslo, we arrived by all-terrain vehicle at base camp in a secret location in the early afternoon. Half the reservists were setting up two-man tents, designed to sit low to the ground to avoid the icy wind. Walls of snow had been dug around the tents to act both as camouflage and protection against gales that can reach 30 knots. Michael Page, an HR payroll manager for 50 weeks of the year, was mid-way through a cross-country skiing drill when I approached him about his experience of juggling two employers. Page was supported by another marine from a Northern Ireland-based headhunting firm, who felt serving in the Armed Forces gave you the decisiveness “that 100 work seminars and inter-office training days could not”. The Ministry of Defence (MoD) estimates that the average reservist receives training worth £9,125 annually to a civilian employer, far more than the average employer spends on individual staff. She cited Steve Garron, a Tyneside environmental health officer and one of the Arctic warfare instructors, who brought skills learned through health and safety training with the marines with him to his job at the council. During our trip, Prince Michael of Kent, Honorary Rear Admiral in the Royal Marine Reserve (and first cousin of the Queen), was flown in to inspect the troops. He examined emergency igloos, designed to be built quickly by troops to protect them from unannounced snowstorms, and met reservists and employers. Prince Michael was adamant that reservists should not be thought of as back-ups for when the regular forces run out of units. 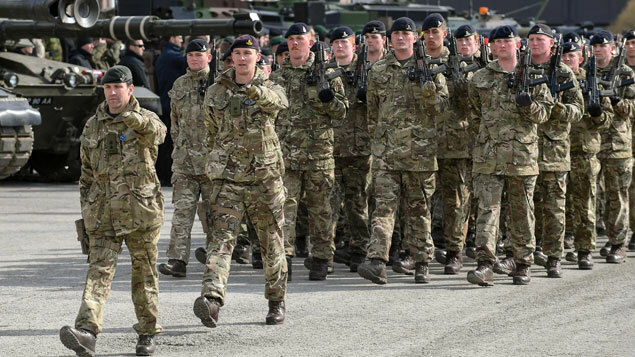 Nearly 17,000 of the UK’s reservists have been mobilised for full-time service since 2003, with each tour of duty lasting around six months in a variety of locations, but primarily in Iraq and Afghanistan. And nearly half the Royal Marine Reservists were active last April. Peter Brennan, director of leisure and amenity services at Wandsworth Borough Council, described one his employees, a tree-surgeon, who suffered shrapnel wounds on his legs and back from a grenade attack while serving in Iraq two years ago. The MoD paid for the reservist’s recovery, and Brennan was able to bring in a replacement by claiming government funds to cover the additional costs. On the final day of the exercise, I was told by Shirley Borscho, head of HR for BBC People, that the trip had completely changed her view of reservists. “I didn’t realise until I actually came and saw this in the flesh exactly what our reservists go through in training for battle-readiness,” she said. “What they view as training for conflict, we in HR view as essential skills that are vital for the leaders that businesses are crying out for.